Kampala, Uganda–My name is Patrick Leuben Mukajanga, a Ugandan human rights defender, am the founder of St. Paul’s Voice Centre a Ugandan based NGO which aims at spiritual nourishing of the marginalized people in our society especially the women and children. More so I am the founder of Dembe Orphanage school which aims at taking care of the homeless, parentless children in Kamwengye and the surrounding areas. At Dembe Orphanage school we provide: – support of the needy orphans with education – We do fundraising to help in procuring these young boys and girls scholastic materials – We also do counseling and rehabilitation of these orphans to make them forget the trauma of losing their parents – We train these young children discipline such as to grow into future responsible leaders and citizens of Uganda – We do spiritual nourishment by teaching them about God and the bible – We offer a home for the homeless orphans in Kamwengye and the surrounding areas. I have been doing this charity work for the 3 years on voluntary basis with the helped of support from well wishers and funders from Netherlands, other parts of Europe and some from USA. 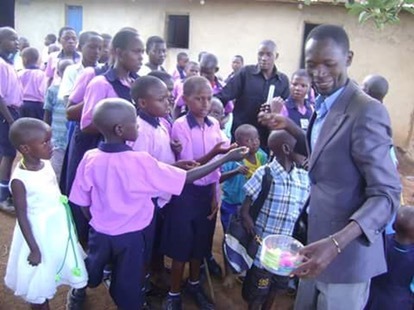 My work at the school is to oversee the activities and see how all programs are running, I also focus much attention on searching for funders to help in fundraising to buy scholastic materials and sustain the school such that activities keep moving smoothly. More so as a religious leader I pray a big role in offering spiritual guidance to make sure these lovely children are rained into future responsible citizens of Uganda. We do welcome children in our school those who have lost their parents, those who are from humble and poor backgrounds and their parents can’t afford paying them school fees and buying them scholastic materials so we take over that burden. Generally we welcome the needy children in Kamwengye and the nearby places. My plans for the future are to expand Dembe Orphanage school into a bigger initiative to make sure all the needy children in western Uganda have a descent upbringing despite losing their parents. My future dream is seeing a bigger Dembe Orphanage, seeing all children happy and living a good life. So my call out there we still need your support to make this world a better place, you can donate to our PayPal account by donatespavoc@gmail.com and donating school supplies through our Postal Office Box, KANONI FOUNDATION P.O.BOX 208, IBANDA-UGANDA.